Find Biotech Solutions at these Local University Based Product Shows. If you are a life science researcher seeking solutions to your biotech research challenges, you can find great ideas and new technology solutions at local, on campus events across the nation. These events are tailored specifically to leading university research scientists. Researchers lead a busy life between committees, teaching, research, and have a finite amount of time to keep up the newest research technology, services, and supplies. We offer one convenient location for scientists to visit many biotech companies, leading laboratory suppliers are eager to demonstrate their new products to you. At Biotechnology Vendor Showcase's, and BioResearch Product Faire's, you will find solutions to your biotech needs. 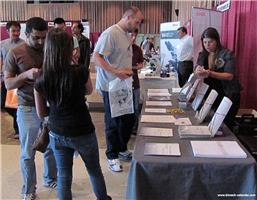 We offer a comprehensive cross-section of exhibitors at all of our events, and events you can also expect to find the latest research techniques, analytical equipment, and products on display. Shortly before our events we post a detailed exhibitor list that we publicize and make available online. At our life science trade shows you can expect to have face to face interaction with company representatives who will be happy to answer all your product questions. This process helps you create a quick and easy way to compare quality and price on similar products from different laboratory supply companies. Time and distance and issue? We plan our event locations on or near many universities making it easy to fit us into your busy schedules. 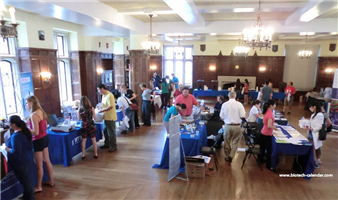 If interested in viewing a complete sample list of exhibitors that attend our events click link. At all of our events we offer a cross-section of life science laboratory supply companies. We collect data from our registration surveys and and use that data to look for new and established vendors to bring to the shows in your area. Below are a few of our laboratory research product and service categories we have at our events. Please click, if you are interested in seeing an extended category list of the life science product and service vendors at our shows. Up to date life science information on grants, university construction, and research projects in our Science Market blog. Event database featuring life science: conferences, congresses, events, and meetings. Social Networks for researchers on: Facebook, LinkedIn, and Twitter. A Company blog to keep up to date with the latest news at Biotechnology Calendar Inc.™. Biotechnology Calendar, Inc.™ hosts life science vendor trade shows for researchers interested in saving, time, money, and seeing the latest new technologies. We have over 60 shows a year at or near universities across the United States. So if you are interested in having quick and easy face to face interaction with laboratory supply companies, hurry and don't miss out on an opportunity to find the latest biotechnology solutions at a Biotechnology Calendar, Inc.™ trade show near you. If interested in attending a Biotechnology Calendar, Inc. event, click the link to see the 2012 schedule and the 2013 schedule. If attending a show please click here to register for a show near you.